Giving users real-time feedback on the progress of application processing is on the wish list of many developers. This can be useful when your application either (I) has long running Xbasic routines or (II) loops through records in a large table. I have built two progress bars that accomplish this. I refer to them as Progress Bar Type I and Progress Bar Type II. 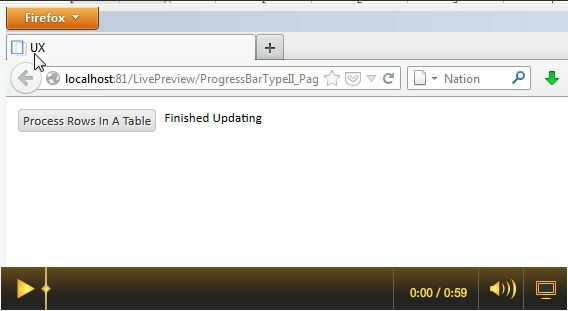 The progress bar has 6 “parts” that must be incorporated into a UX component (our sample UX component is called ProgressBarTypeI.a5wcmp) where you want to use it. Part 2 is the graphic elements that are displayed in the window. These are border.png, whitebox.png, and bluebox.png (these must be loaded in your project and published with the component). Part 4 is the Xbasic code that is run by the Ajax callback (you should place the Xbasic code you wish to run in any or all of the 6 functions named xbgroup1, xbgroup2, … xbgroup6). (The code for the Ajax callback (myXBcallback) and the xbgroup functions is found in the Xbasic functions in the Code section of the sample UX component). Part 5 is a free-form HTML element on the UX component with a div with id=“PB”. Part 6 is local CSS definitions code (found in the UX Properties CSS section of the component). This progress bar also has 6 segments (blue rectangles). As with Progress Bar I, the size and color of the elements that make up the progress bar are all customizable. 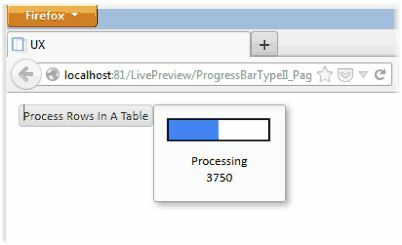 To use Progress Bar Type II, you must know how many rows are in your table or resultset and, if you use the default setting of 6 segments, you should decide on an increment that is >= 1/6 of the rows. So for the sample progress bar in the video, my table has 7305 rows. 1/6 of 7305 is 1218 so I chose an increment of 1250. 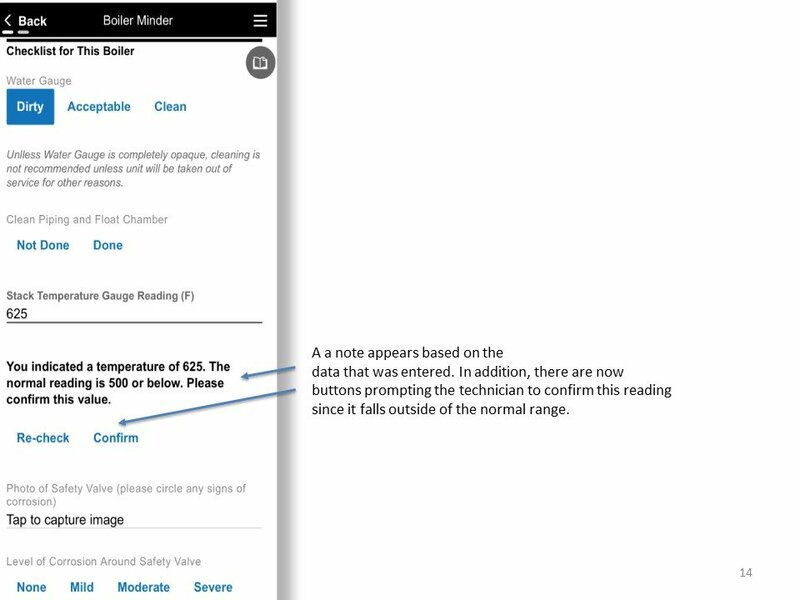 Progress Bar Type II has 7 “parts” that must be incorporated into a UX component (our sample UX component is called ProgressBarTypeII.a5wcmp) where you want to use it. Part 5 is the Xbasic code that is run by the Ajax callback. This code is comprised of three functions myXBcallback, setSessionVariable, and processMyTable and is found in the Xbasic functions in the Code section of the ProgressBarTypeII UX component. To use the code, you must set the name of the table to be processed in the processMyTable function (in the sample component, the table mmvisits2 is opened) and the code you wish to use goes between the comment lines in the sample component in the processMyTable function (note there are two sections where you must repeat your code – the second section processes the final row in your table). Finally, in the myXBcallback function you must set the variable myincrement to the increment you calculated for your table. 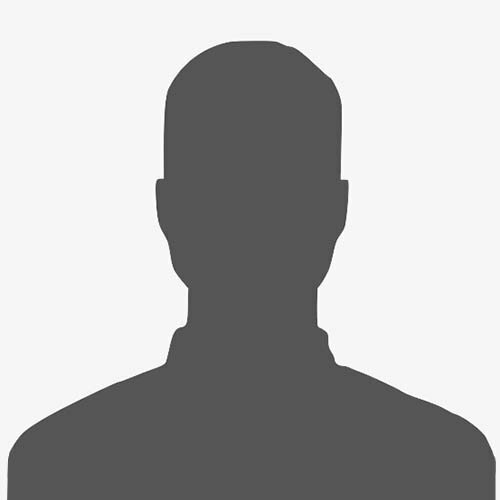 Part 6 is a free-form HTML element on the UX component with a div with id=“PB”. Part 7 is local CSS definitions code (found in the UX Properties CSS section of the component). For questions or more information please send an email to jeff.benson@highbrookcreate.com. 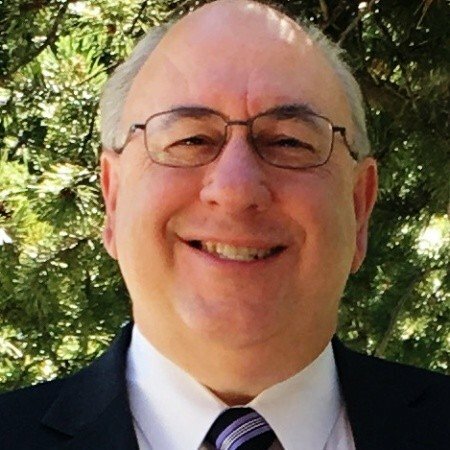 Jeff is available for mentoring, consulting, or development.